I’ve bundled up three of the stories I’ve written which were set in Aphanasia into a collection I have cleverly titled Aphanasian Stories, and it’s now available for you 🙂 Including in this collection of re-released stories are Lost and Found, which was originally given away here on this blog, A Love Story, which was originally published by Sam’s Dot Publishing as Shades of Green and Sister Margaret which was originally published by Wild Child Publishing. A Love Story: Z’thandra, a swamp elf living with the Reptar, discovers a human near the village. When she falls in love with him, she faces the most difficult choice of her life, a decision that will affect the Reptar for generations. Lost and Found: Xavier, the escaped subject of a madman’s experiments, and Colby, a young lady on a mission to save her brother, must combine their efforts to elude capture and recover the magical artifact that will save Colby’s brother before it’s too late. Sister Margaret: A vampire hunter and a half-incubus swordsman are hired by a priestess to kill the undead pimp that is extorting, torturing and murdering vulnerable girls. The physical copies of these books are fan-freaking-tastic, no word of a lie. The original art is the illustration I commissioned from Darek Zabrocki long ago for Lost and Found and Jo (my husband) had turned it into the sort of wrap around cover that dreams are made of (mine anyway). However, if you like to read electronic books I’ve got good news for you. 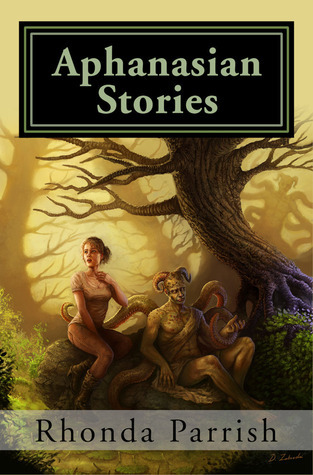 The Kindle version of Aphanasian Stories is available for free for May 15th and 16th. When you combine Lost and Found, Shades of Green (with a new title) and Sister Margaret into one self-published collection you get Aphanasian Stories. Clever title, no? LoL This book is available now but I don’t have time to promote it yet so what I’m going to do is pretend that it’s not available. Yet. Come the middle of May when the Niteblade fundraiser, Blogging from A to Z, Camp NaNo and April Poem a Day are done, and I’ve recovered a little bit, I’m going to officially release this book. If you don’t have a blog, I’d still like for you to be a part of this launch. I’m giving away three copies of Aphanasian Stories on Goodreads. You could be one of the lucky winners, all you have to do is enter at the website. Giveaway ends April 20, 2013. S was going to be all about the stories I’ve written that were set in Aphanasia and started with the letter S (Shades of Green, Sister Margaret and Shadows) but I’m tired. This month of blogging thing is a lot of work, and combining it with the other two challenges I did was a mistake. So, I’m going to be lazy today. Today S is all about Shades of Green. Shades of Green was a breakthrough for me. It was the first time anything I’d written was published in a physical form where I was the sole author. My work had been included in a few anthologys or collections, but it’s not quite the same as being the only name on the cover. The only person with words on the pages. It’s not a novel though, so while it checked a lot of boxes on my Bucket List, that one is still empty. My back cover text and the endorsement Marge Simon gave the novella are below. If you’re intrigued at all you can click the cover image above and it will take you to a page where you can read the first chapter for free. -Marge Simon, Stoker winner, VECTORS: A Week in the Death of a Planet, 2008. Okay, I admit it, the link between the topic of this post and this picture is pretty weak, but it’s the best I could do without actually taking a photo specific for this, and because of procrastinating I just didn’t have time for that. Whee! So, this blog post is going to be about Goodreads which is about books and that’s a picture of a replica of an 1885 Canadian schoolroom. School / Books. It’s the best I could do. Well, I could have put a Goodreads widget there, but I couldn’t get the formatting to look right. I tried. Honest. So, about Goodreads. I really like it. I think the main reason for my affection for this particular website is that it makes reading cool. You get to share what you’re reading, what you’ve read, and also your thoughts on each book. You get to use cool little widgets on your website to show off your library or challenge yourself to read a certain number of books every year. When I first signed up for Goodreads I actually tried to add all the books that I owned to it. I don’t think I made it through more than one bookshelf (we have ten… ish. I can’t remember off-hand and I’m too lazy to get up and count) before I came to my senses. Now I just add books as I’m reading them. I love that Goodreads will share them on my Twitter feed for me, and I usually remember to update my status for #Fridayreads (though I never remember to tag it LOL). What’s more, Goodreads hosts giveaways. I ran two giveaways of Shades of Green there when we released it, and I’ve also entered to win a great many books. So far I’ve only won four, and unfortunately I didn’t like three of them LOL But still, it’s better to find that out without having to spend any money, right? And happily the people who won Shades of Green (and reviewed it) seemed to like it, so yay! If you’re not using Goodreads you ought to take a peek and consider it, and if you are, I hope we’re friends there. I don’t usually post on forums, join groups or send out messages, but I do often decide what books I’m going to read based on what my friends are reading and what they’ve enjoyed. This blog post is part of the Blogging from A to Z challenge over the month of April and was brought to you by the letter G. I’m taking tomorrow off, but if you come by on Monday I’ll be talking about Hobbies. I liked this story, it was quick and to the point, and didn’t really need to be any longer. And it was nice to be surprised by the ending. She gave it 3.5 stars out of 5, and her full review is right here at her website Spoilers and Nuts. You know, I’m still not happy to be unemployed, but I am beginning to feel like my life is more under control than it has been. For the longest time I’ve been doing too much and trying desperately to try and figure out how to balance things and where to cut back. Now I’m getting things done and the other day I almost managed to do everything on my to-do list. I realise how pathetic that sounds, but it’s absolutely true. And it’s progress. Could be that I’ll go back to work sooner or later, but right now I’m truly enjoying feeling like I’m climbing out of the hole I’d plunged myself into. We’ll have to wait and see if NaNoWriMo plunges me right back into the pit. It could happen. I have a basic premise for the story and one character and that’s it. Not exactly a strong platform to go into NaNo on, but it’s what I have so I’m going to work it. My plan is to embrace this as a chance to feel out the story and find out how to tell it. I don’t expect anything good but I’m not going to resort to any of the word-padding ideas so popular in November. We’ll see how it goes. In other news, my poem After The Storm is up at Tales of the Zombie War. They have a comment option so you can tell me how much you hate it (Kidding, please don’t. I want you to like it. Like it, I say! :-p). Finally, World of Warcraft has recently gone through a very disruptive patch. It’s been kinda crazy and overwhelming, in no small part because I have far too many characters with too many specs that I need to relearn how to play. Still, I’m muddling through. Right before the patch, however, I allowed my WoW nerdiness and my fiction writing to collide and snuck off to take a screenshot to share. Please note, this screenshot is rather spoilerific if you’ve not read Shades of Green. Also, if you’ve not read Shades of Green you won’t likely find it very amusing, so click with caution. I’m sick. I don’t do sick well, I turn into a whiny, sniffly, self-pitying mess. Good times! So I spent most of yesterday doing those things, which is why I didn’t get a blog entry done. Today I’m feeling slightly better, so I’m whining less, but still feel like I’m in a cold medication-induced brain fog. So, my blog entry is going to be a mindless and shameless self-interested plug. Forgive me?